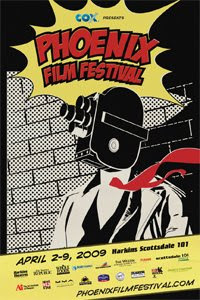 Well, the '09 PFF is in the books and I have to say that this year's festival was not that good. This year, more than ever, it seemed disorganized, frenzied, and lacking in a lot of areas. With that, I place the blame for the slide in quality squarely on the Festival Directors. For starters, this year, there seemed to be less space allocated for the fest. They got rid of what I thought was the gem of this Festival, and what seperated it from a lot of those "wannabe" festivals, and that's the tent. They settled on a "Party Lounge" across the parking lot. It was loud, cramped, and lacked a lot of seats. Finally, it seemed that they were more interested in keeping their sponsors happy than the festival goers. They also missed the boat on bringing in top flight talent. They need a real shot in the arm that only an A-lister (or a high B-lister) can bring. Not that I didn't appreciate the talent that did show up. They brought in funnyman Bill Engval, Lisa Simpson (Yeardley Smith), and Virginia Madsen. Sadly, though, that's just not enough to elevate the PFF to an elite Film Festival. So I implore Chris and Jason to "bring it" next year, so the PFF doesn't continue it's slide into obscurity.